One of the most elaborate stage shows in rock...a feast for the eyes and ears. A really great show at the old Horton Fieldhouse. Tremendous show, one of the best concerts I ever saw. 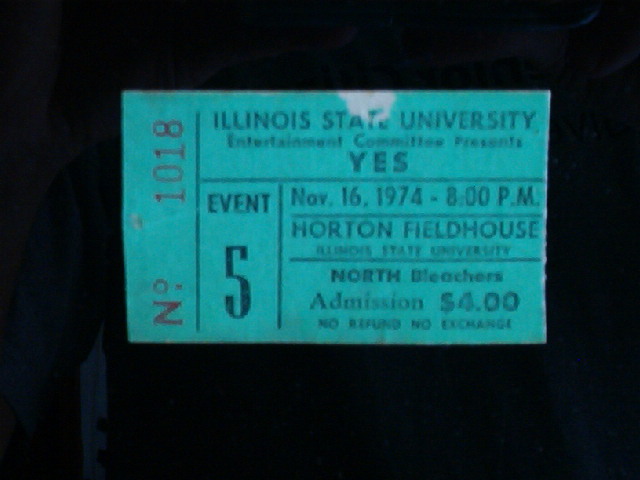 Like Tim said, it was Horton Field House and not Redbird Arena -- Redbird didn't exist then. The sound in Horton was never very good, it was a basketball stadium built for quantity not quality. Somehow Yes pulled it off. Fortunately we were sitting on the floor in the middle and not off to the side where things tended to get muddled at Horton. The Gates of Delerium is still one of my favorite songs and I'll never forget hearing it for the first time. One of the highlights of the evenings was being introduced to Gryphon, the backup band. Within a couple of weeks I and many of my friends were huge Gryphon fans, a band none of us had heard of previously. Just a correction: The city is Normal, Illinois and the venue was the Horton Fieldhouse. Redbird wasn't built until the late 1980's.